The next stage in the development of a proposed £8bn nuclear power station on Anglesey has been announced. Regulators will look at safety, security, environmental and waste implications of the new reactor designs. If everything goes to plan, Wylfa Newydd will be built on land near the current Wylfa nuclear power station. Both the secretary of state for Wales and the local MP said it was a significant step. Hitachi bought the site in 2012 for around £700m, and the power station will be built by a subsidiary, Horizon Nuclear Power. Last year Horizon named the new development Wylfa Newydd, which is Welsh for New Wylfa, in recognition of the "opportunities" it would bring. Hitachi has opted to build a smaller plant, deciding to construct two reactors - called Advanced Boiling Water Reactors (ABWR) - instead of three. The latest round of assessment by the Office for Nuclear Regulation (ONR) and Natural Resources Wales is known as "generic design assessment" and is carried out before site-specific proposals are put forward. In addition Hitachi will be launching its own design comments process which enables anyone to submit their views or ask questions. The ONR said the assessment allowed it to check aspects of a reactor's design to see if it was suitable for use in the UK. The process is expected to take around four years to complete due to the complexity and level of scrutiny required. 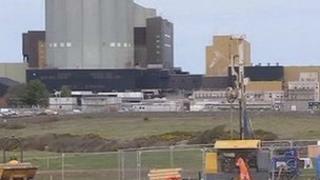 Secretary of State for Wales David Jones said his backing for a new nuclear plant was "steadfast". "However, it is absolutely right that the proposed design of any reactor to be constructed in this country is subjected to stringent safety assessments led by the independent regulators," he said. He added that Anglesey had much to offer in terms of the skills of the existing Wylfa workforce and the enthusiasm of young apprentices at Coleg Menai's Energy Centre at Llangefni. "The benefits which local businesses, and businesses across Wales, can derive from the investment that Hitachi-GE is making in the UK are limitless," he said. Ynys Mon MP Albert Owen said: "This is another very positive step during the most difficult stage of the process. "This is already proven technology and I'm delighted they have been able to dot the i's and cross the t's so that Wylfa gets on to the next stage. "I was at the Japanese Embassy recently and they said that they are very happy with progress."